lycoming county pa | How Should We Do the Mountain? GAS TRUTH OF YORK is sponsoring the YORK MARCELLUS SHALE FORUM so that you can learn what you need to know about Shale Gas drilling in Pennsylvania. In South Central PA we do not have Marcellus Shale drilling but the Oil & Gas Industry is affecting our water, land, and the integrety of our politics. Professor David Fyfe from York College will be the MC and moderator. Check this link for a map that corresponds to the pipeline information below. Central New York Oil & Gas (CNYOG) company has applied to the Federal Energy Regulatory Commission (FERC) to build and operate a 39-mile long, 30-inch diameter natural gas pipeline that would run through parts of Bradford and Lycoming Counties in PA. There are compressor stations involved, also. This pipeline will probably involve eminent domain issues. Scroll your way to page 18 of the 22 pages on the site. Below is a copy of the section on that page pertaining to the project (MARC I Project). This article came to me this morning from the RDA. About an hour after receiving it I also received some info form them on what “airfoam HD” is and what is in it. See after the article. “They’re attempting to determine what caused this problem and what actions they can take to stop it,” Spadoni said of energy company representatives, with whom DEP members have been communicating… The only precaution Spadoni recommended to residents is to avoid the suspicious spring water run-off in the area…. “I don’t think you would want to drink this discharge,” he said. 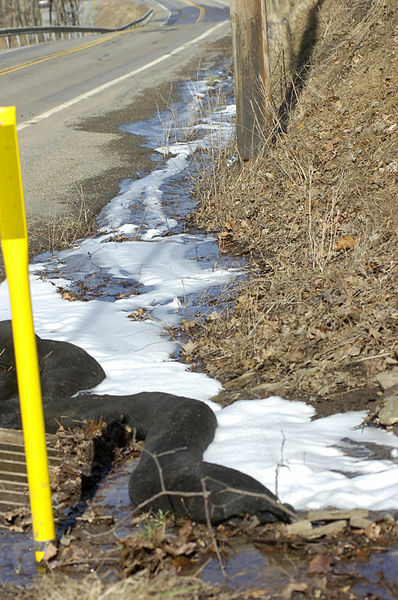 The substance leaking down the hill isn’t listed as dangerous on a Material Safety Data Sheet, according to Spadoni. “We don’t know for sure what its chemical composition is,” Spadoni said. (1) if we don’t know the chemical composition, how can we know if it is or is not on the Material Safety Data Sheet and is or is not dangerous? (2) how to get the word out to illiterate wildlife and aquatic organisms not to drink from this stream. 2-Butoxylethanol (2-BE) is a foaming agent used for natural gas production and is proven to cause cancer in animals. 2-BE is a primary component of AirFoam HD, a product that has been found on drilling pads in Pennsylvania — the MSDS sheets for Air Foam HD state that is dissolves in water and that chronic exposure causes cancer. Testing for 2-BE costs over $100 per test, and the cost burden is on the landholder — the DEP has failed to test for drilling or fracking chemicals in their standard tests which are only performed when landowners report problems in their water supply, not before the problems occur. Residents who will soon have natural gas production occuring in their region or upstream from their groundwater supply must hire an independent water testing company to do a “baseline test” to show the lack of contaminants prior to the drilling. Without a baseline test, it is more difficult to convict a drilling operator for water contamination – the drilling operator can claim that there is no proof that the contaminant was not in the groundwater supply prior to the drilling. the products. The sheets are also designed to inform emergency response crews in case of accidents or spills. manufacturers determine what is revealed on their MSDSs. 2-Butoxylethanol (2-BE) is one of the nastier things the drilling industry uses, It is soluble in water, vaporizes in air, and is taken up through the skin. It can cause a very specific adrenal tumor linked to its exposure. According to Theo Colborn at the Endocrine Disruption Exchange, it is implicated in a wide variety of health effects in most systems of the body and should be handled with great care. Studies have indicated there is no known level of dilution where 2-BE doesn’t have effect on organisms. You can download the spread sheet at the link below.